Start them young at Team Socceroo! This is where the child's first love begins in football. The sessions are designed to get the child interested in the sport through safe and fun activities, games, and drills. The continuous sessions of the young footballer leads them to be comfortable with the ball, to follow instructions from the coach, to play with teammates, and of course, to enjoy their exercise time! 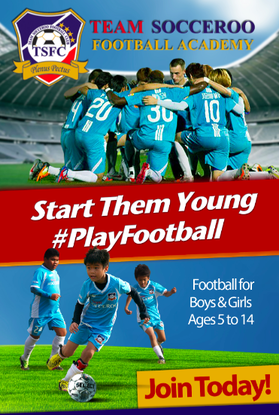 With continuous football training, these young footballers will learn more than the foot skills and technical skills - passing, dribbling, shooting, controlling, and tricks, etc. The sessions are also designed to develop an understanding of the game, to follow the rules, and to play as a team. Through internal matches within the club and junior tournaments, the footballers will learn respect, solidarity, and to give their full heart (plenus pectus) in football, whether they win or lose games. This prepares them to become passionate and excellent players on and off the football field. · Players can join any part of the module, pro-rated fees of Php 500/ session will be applied.